Use our photo collage maker to create personalized wall art that’s uniquely “you”. Our photo collage posters are printed on matte photo paper and you can choose from a wide range of layouts to showcase your fondest memories. Then, select a background color to either match your décor or compliment your photos. For one-of-a-kind collages, Print Shop Lab is your final destination! 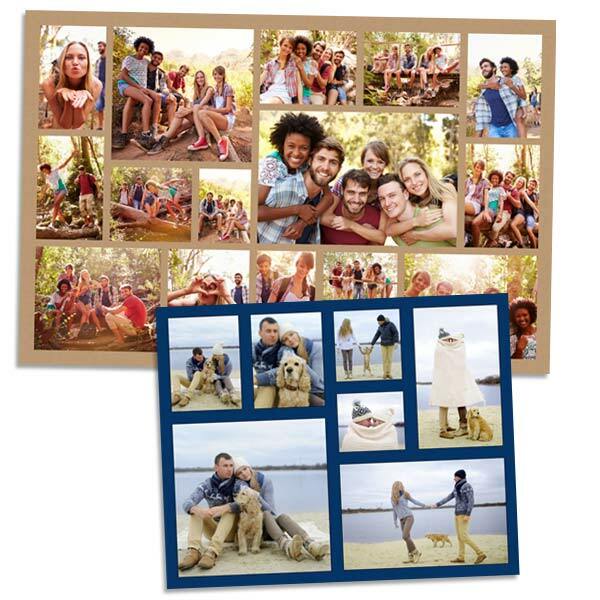 When you can’t decide on a photo to print and frame on your wall, you can’t go wrong with our photo collage poster prints. Upload a series of photos from your phone, tablet, or laptop to get started. Maybe you spent a week at the beach over the summer or you have some photographic favorites of your pets. Upload them to Print Shop and create a collage that has a specific theme. Or, pick out pictures from years past and make a collage that celebrates your best overall memories. After selecting and uploading your photos, you can put together your collage with ease using our photo collage builder. 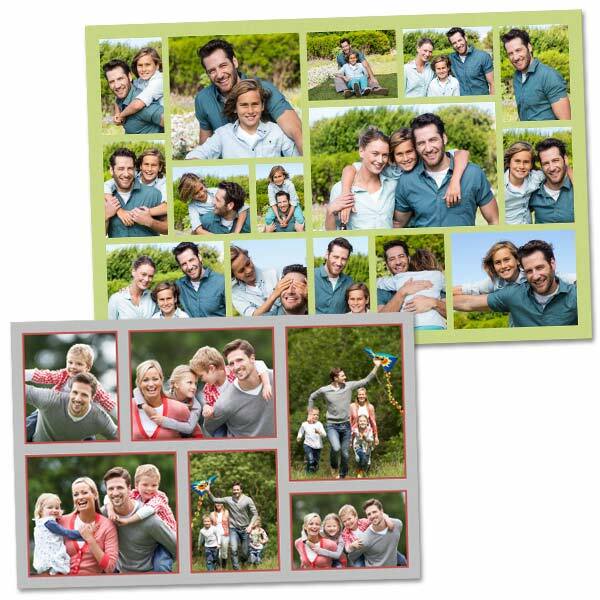 Just pick your collage print size, select your background style or color and then begin placing and arranging your photos on your selected layout. When you’re finished, place your order. It’s that simple! 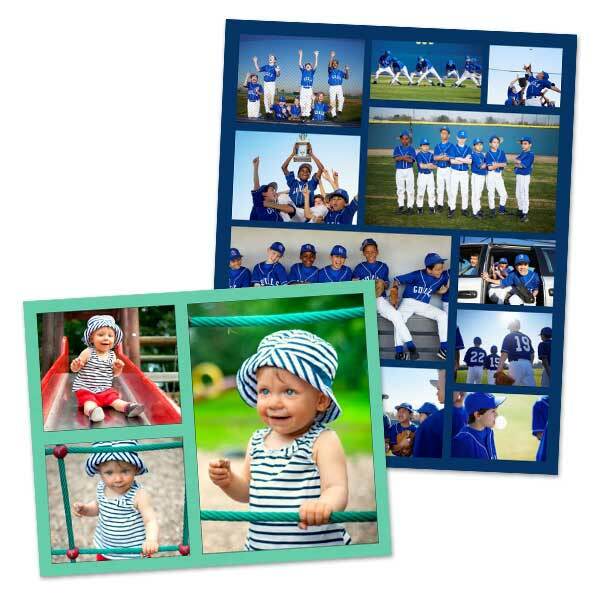 Nothing brings a smile to loved ones’ faces like a personalized gift, and our photo collage prints are no exception. Furthermore, you can upload photos from friends, family, and even Facebook to create your masterpiece. Collage prints are ideal for holiday, birthday, graduation, Father’s Day, and Mother’s Day gifts. Once they arrive, pick out a frame to elegantly showcase them and present them to your friends or family. They’re personalized wall décor that comes from the heart! You may have shopped around at local home décor stores and walked away empty handed. As far as wall décor, you can’t go wrong with photos! Furthermore, they add a personal touch that you just can’t get with store bought décor accessories. Find your favorite photos on your phone, computer, or Facebook account and create the perfect collage to hang on your wall. We have a variety of photo collage sizes so you can create something special for a drab nook in your kitchen or a focal wall in your living room. Also, we offer several background options from various solid colors to stylish patterns that make the perfect accent to your home! From wedding photos to vacation pictures, we all have treasured digital photos just waiting to be printed and preserved. The same holds true for Instagram photos. That’s why we offer Instagram collage posters that you can frame and incorporate into your décor. Feature up to 77 Instagram photos and brighten up your wall in a unique, new way! Besides classic collages printed on photo paper, we have even more options in case you’re looking for something different! Each collage is easy to create since you can select your layout and then drop your photos into place. Upload your best pictures from the past year and design a meaningful keepsake that you and your family will enjoy for years to come! In addition to cheap photo prints, we also offer the best quality canvas prints online! We also make collage canvas prints! Select from gallery wrapped canvas or floating frame canvas options to make a statement with your photographic treasures. Our canvas photo prints are available in a range of options so you can coordinate them with your interior.